We have been in a great deal of fog in Seattle. The other day we went on a walk and after we were up a couple of hills, we found some sunshine. Colin complained it was too bright since he is not used to the sun. By the time we walked home, more fog came in and stayed all day. Colin also enjoyed the playground toys. 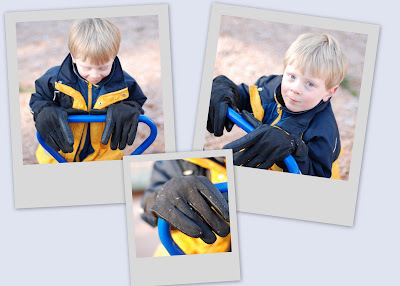 It was cold and the only gloves I had were adult-sized. Here are a few photos from our little camera that I had not downloaded. Above is when we were staying in a hotel in downtown Seattle due to all the snow. The opera put us up so Brian could be closer in for rehearsals but then all the rehearsals were canceled. We were right across from the Seattle Center and we rode the Monorail to the only stop available. It was crazy to see so much snow in Seattle. Colin on Christmas morning on our way to the Stuckis. He is holding his new Sheriff car and stocking loot. New Years Day Stucki reunion. This is all the grand kids minus three. Colin was having a melt down. Our dear friend Susan and boyfriend Larry were in town and we got to meet up for the afternoon. So great! 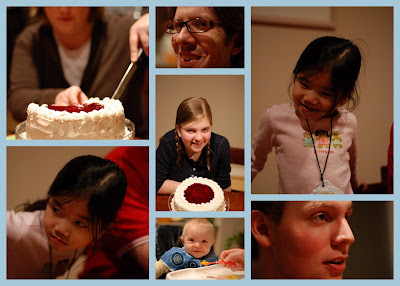 Our niece Anna turned 13! 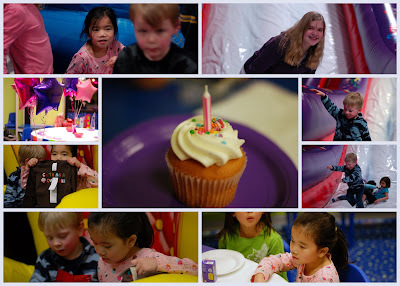 And Maggie had a birthday party. She turned 6, represented by 1 candle. 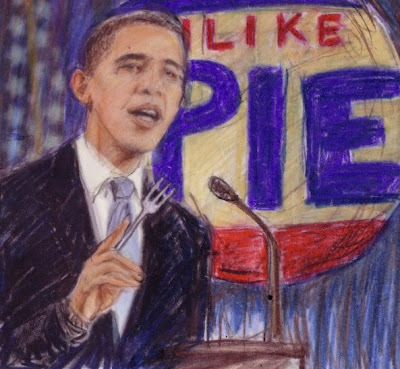 Artwork c/o Sue Anne of Pie Headquarters. 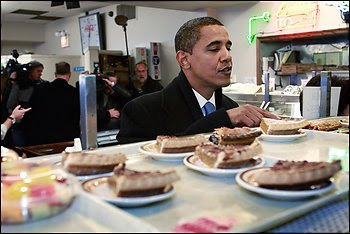 Apparently our new President likes his pie. Hooray! I enjoyed as much of the Inauguration speech as Colin would let me. So happy my absentee ballot from California went to Obama! Brian let me sleep in this morning and I woke up from a bizarre dream that it was the Inauguration but my uncle Frederick had been President. They were already making a movie about his presidency and I was very impressed with the actors they cast as my grandparents. Then I was attending a parade with Megan Hardy (of Sushi Party, Megan Hardy) and she had some strange, extra large raspberries that she called ambrosia. Weird. A few more opera photos, mainly from the dress rehearsal. We borrowed them from the production photographer's website, so they are very low quality. We are figuring what ones to order from the opera's photographer. The Pearl Fishers is a story of a love triangle, as you can see in the photo above. I was able to go again on Sunday (thanks to sister's family keeping our kids again and to the opera staff who found me a wonderful seat.) It was a great show and somehow very touching to me that day, even though I had seen the opera twice before. Great work Brian! These shots are from the duet, "au fond du temple saint", the only really famous piece from the opera, which is not performed all that often. The duet really is one of the most beautiful things in all of opera. Brian was pretty freaked out when he heard about the costuming (or lack thereof) this summer, but after a lot of hard work, he's not totally humiliated. This is Brian's entrance after several years of living as a hunter in the forest. I brought our camera so I could document backstage with more than just a cell phone camera. The opera opened this last weekend, and things went really well for Brian despite having a minor cold. The timing of health issues has matched singing obligations recently, but we are optimistic for no more colds for the rest of the opera run. I was able to attend the Sunday matinee (thanks to child care from my sister's family) and Brian sounded great and looks great too (I'll try to get some photos at the next show since this is the Shirtless in Seattle production, but here is a photo Brian sent to my cell phone- he originally said it was for my eyes only, but that was only after I showed it to my sister's whole family. And since several thousand audience members have seen him it is safe to share it here. Observe the spray tan glory). It is a very impressive production, complete with actual pearl diving. Brian has loved working with Seattle Opera. 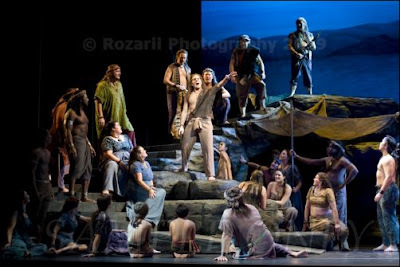 Ok so I really liked The pearl Fishers, of course there was, for me at least, some racial/ignorant undertones. but like i really liked it. My favorite part that i liked the best was the whole third act. like when who was it, Zurga's bed thingy when up when he found out that Leila was the girl that saved him a long time ago, and when he put the whole village thingy on fire. Zurga was dead set on killing them both, but when he found out who Leila was, he risked his life for her. Its kind of faulty tho when you look at it, i mean he was gunna kill his best friend, but because she saved his life that long time ago, he saves 'em. I mean he could have looked the other way. Oh and i didn't like that i couldn't figure out which was Zurga or Nadir, but i liked it, but as i said in class, if it wwas in fact set in Mexico i believe i would have more to say, but because i cannot say the muic should have been this way or that way because i dont know really how Sri Lankan music sounds or really how they dress, even though im pretty sure they didn't wear close to nothing. so yeah. On a slightly related note, it was cute to read the kids' opera reviews because many of them commented about how they liked the opera more than they thought they would. 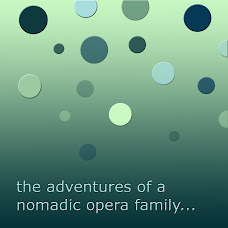 If any of our blog readers want some opera homework, we are part of a discussion group at home and Brian lead a dialogue about the relevance of opera last June. Here is a link. Colin was being cute in the bath at his cousin's house. He loves goggles. It has been awhile since Stuckihouse had any bum photos. I love the bubble bum. Jane is just about the most delightful little thing ever. We weighed her last night and she is 22 pounds of baby goodness. She now has three top teeth and is on the move. She is already interested in electrical outlets so I guess it is time to get more of those little plastic covers. And if I thought I could not get anything done before, I think I am entering a very busy baby/toddler time. Our niece Maggie turned 6 today. We had a lovely birthday dinner and she has a party coming up next week. Hooray for Maggie! Colin and Maggie contemplate the cake. Colin gets a little overwhelmed by other people's birthdays because he wants them to be his birthday. He did relatively well. Maggie's birthday wish was for Colin to not be 2 and since his birthday is coming soon, she will get her wish. Below is a photo from my sister's camera that shows why Maggie wished Colin was not two. It was a fine little moment for Colin. We spent the penultimate afternoon of 2008 at Pikes Place and near there. I loved this guy holding flowers. Salsa Lizano is kind of the national salsa of Costa Rice. After spending about 6 months in there, I love it and have had trouble buying it recently. The little Latin market near Pike Place was selling it for nearly $14! For that price I only took a photo and left it at the store. Post Alley has a lot of gum. Lots.